Concrete is often used for the construction of buildings or roads. Because it is strong and durable, has been becoming the choice of many contractors for years. However, the Topmix Permeable concrete was different from most that is often encountered many people. The concrete was designed to be a cover surface with super absorbent which allows water to seep through. It avoids stagnant water on it so it could be an effort to cope with floods. 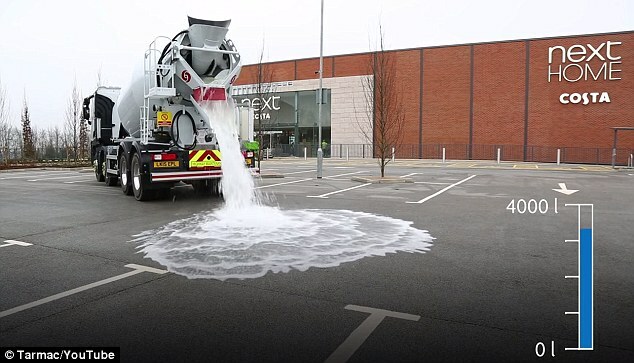 On the video shows the material being tested in a parking lot had been drank at least 880 gallons (4,000 liters) of water in about one minute. Most of the water disappears immediately after touching the surface. Meanwhile, to prevent the flooding during storms, the concrete can also help make the roads or bike paths safer because it prevents puddles. The porous concrete layer on the top surface allows water to flow through a relatively large gravel matrix to more loose debris underneath. The drainage channel at the very bottom will help increase the amount of water that can be absorbed. In addition, the concrete can not only help overcome flash floods in urban areas, but also helps reduce heating bitumen in hot weather. "The porous concrete surface allows water drained even when large volumes of water and with high bulk," says the Permeable Topmix brand holder company, Lafarge Tarmac. During periods of high temperatures and intense rainy season, the concrete can help to delay the discharge of surface water into the drainage system so as to reduce the risk of excessive water or causing flash floods. "As intense rainfall, water stored in the evaporated system and creates a cooling effect that reduces surface temperature," explains Tarmac. The porous concrete concept has been discussed around for almost 60 years and is often used under asphalt to help aid drainage. The similar technology has also been applied in Indonesia and developed by Holcim Indonesia. With the name of ThruCrete, the porous concrete street can absorb water and prevent flooding. Holcim ThruCrete have the pavement thickness of 15 cm with the thick of bottom layer (base coarse) was 7 centimeters and 30 percent air voids. The concrete can accommodate as much as 66 liters of water per square meter.